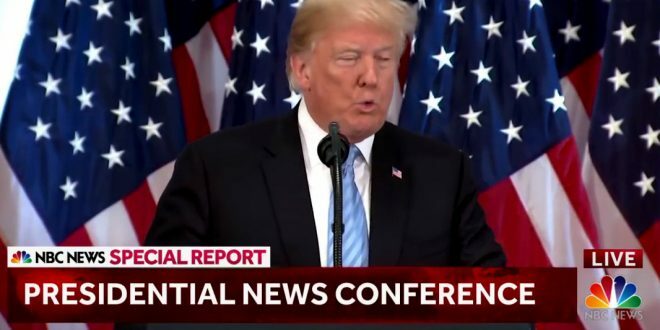 LIVE VIDEO: Trump Holds Rare Open Press Conference - Joe.My.God. President Trump is holding a rare open-ended press conference in New York after the United Nations General Assembly. This comes as his Supreme Court nominee, Brett Kavanaugh, faces increased scrutiny ahead of a Thursday hearing with one of his accusers. While Mr. Trump met with the world’s top leaders Wednesday, it was domestic politics that dominated headlines, as attorney Michael Avenatti released a sworn declaration from Julie Swetnick, who claims Kavanaugh was “present” when she was “gang raped” at a party in high school. Kavanaugh is expected to testify, along with his first accuser, Christine Blasey Ford, before the Senate Judiciary Committee after 10 a.m. Tuesday.